This is Maggie. 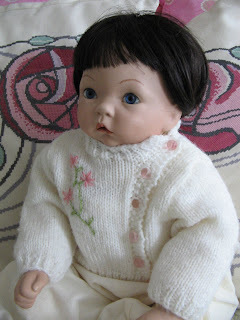 Mum made this doll through a series of workshops a few years back (fifteen, perhaps). She did a fantastic job on her- hand painting the face, arms and legs, sewing the body, and adding the hair and eyes. 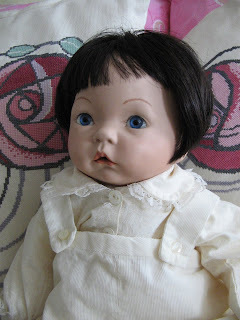 Maggie has fair skin, dark hair and blue eyes (like Mum and like me), that's not an easy look to find if you're shopping for a doll - it's always blonde and blue-eyed or dark hair and brown-eyed (sigh). 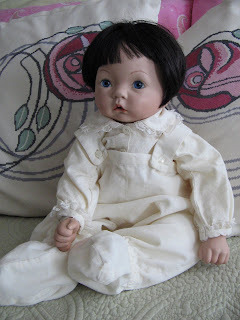 She also sewed the blouse and cord dungarees. It was heaps and heaps of work. 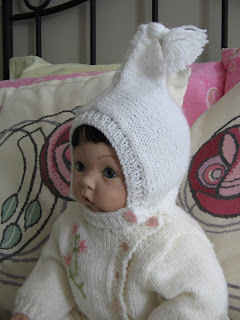 I think Mum thought these were the same yarns, however the sweater is off-white and the hat is white, sorry Mum, I know it doesn't happen often, but you made a tiny boo-boo. Still a very cute set. Isn't she sweet. Maggie has lived with Mum and Dad a long time now, but Mum promised her to Elly "when I go". 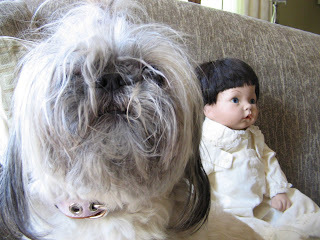 I doubt Mum is going anywhere soon, but when Elly went to visit them last week Mum insisted that Maggie return with her. Maggie is going to live with us while Elly is studying in Ireland. She starts school this September and will be gone for three years. So now I have two foster children. 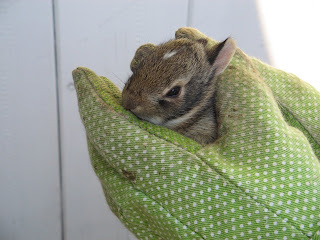 Here's the bunny shots of the day. They all opened their eyes yesterday, and started to wander a little ways from the nest. I needed to mow the back lawn today and since they've started to move around, we put them in a cardboard box and set them in the shade on the deck (I wouldn't want them running under the mower - ick). Here's Flipsy. A corner of his/her ear is missing. I blame Gus, though we do keep him on a lead when he's in the back. They're growing so fast that they may be gone from the nest before I have to cut the lawn again! Hmmm... 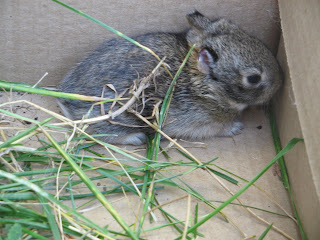 I'll have to keep an eye on the bunny that likes to mow our grass to see if he or she shows up with some littles in tow! Granny says that Maggie is eighteen, not fifteen. Still, she's aged well! Oh Maggie looks so nice in her new hat! I always take her out of Granny's closet when we visit and I put her in all the different outfits. 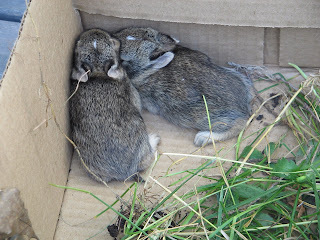 The bunnies are growing up so fast they'll have their own fammilies and all by the time I see you in August.